I'm trying my best to kind of gather up all of my scrambled thoughts for this one because not only was it fantastic, but it was heart-wrenching! Tempest kept me at the edge of my seat and was an astounding and beautiful tale of how, as Jackson my man would put it, "Amor vincit omnia." Love conquers all. I'm not one for the usual fluff romance. Don't like it. But, there was more to Tempest that stole my heart. Okay, so lately I've been reading quite of books that have half or full male POVs. I'm not sure why, but I love them so much. And don't get me wrong, I do certainly enjoy reading a book in a girl's POV, but I've come to very much enjoy the voices of guys in books. And this does not does not exclude Jackson. Jackson was not the character that I thought him to be. And the fact that he was able to prove me completely wrong within the matter of a few chapters is impressive. Usually, I'm able to pinpoint the type of person a character is because their characteristics are usually obvious and sometimes stereotypical. I fell in love with Jackson's character pretty quickly and wanted to give him a nice big squishy hug for a huge part of the book. No lie. And there were the threat of tears, but that's another matter entirely. Jackson was real. I felt him through the pages (weird expression but it's true). I just . . . he's my new favorite YA man. However, there were a few things in Tempest that niggled me. While it was full of plot twists and such, it was a little predictable every now and then. It's not a big deal necessarily, but it's just one of those things. Another problem is that I thought the pace of the book to be a little choppy here and there. Again, not a big deal, but it was a little uncomfortable for me. It was kinda like that student driver that's all smooth sailing on the road and then all of a sudden slams on the brakes and continues on. In the case of the book, it was like a light slam on the brakes. Overall, Tempest was fantastic read. 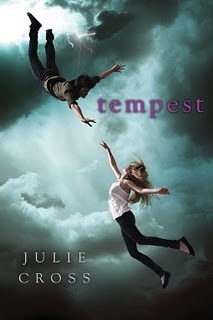 I usually don't describe books as beautiful, but Tempest certainly earned the title. Cross effectively conveyed Jackson's emotions throughout the story and created a highly entertaining story for readers. I wish I could have said more about this book, but I'm positive I will give something away if I do because Everything is a Secret! It's kind of like Doctor Who in that way. Fans of sci-fi, time travel, and a breathtaking narrative will possibly enjoy this book. Im glad that you loved it, despite it being a bit predictable! im not such a fan of time travel, but maybe i should give this one a try! Lovely review! While I surprised myself by enjoying this book, it seems like I didn't love it as much as you. I didn't really connect with Jackson as much it seems like you did. But I really did like having his male POV, not going to lie. The plot definitely lagged as well, which was a huge deterrence for me, unfortunately. But, I did end up enjoying Tempest, and I hope I like Vortex even more!